It isn't all good news, though. Beyond Indy, Will Power faces an uncertain future. Sydney's Ryan Briscoe has qualified second on the grid for the 2009 Indianapolis 500 - the best ever result by an Australian driver at the Brickyard - while fellow Aussie Will Power will start in ninth. But Power is very aware that his career could stall unless he posts a memorable result in the 500 miler. Earlier this year Power replaced Helio Castroneves alongside Briscoe at Penske Racing while the two-time Indy 500 winner was facing tax evasion charges. The Queenslander drove in the first two Indy Racing League races, for a sixth and second, before the Brazilian's court acquittal meant Power was surplus to requirements. Still, Roger Penske elected to enter Power in a third car for Indy. Despite his impressive performances in limited opportunities, Power has no guaranteed future with Penske. Roger Penske, the most successful owner in Indy history with 14 victories at Indianapolis Motor Speedway, wants Power to concentrate on the Indy 500 and only then will discussions take place on what may or may not happen next. Roger Penske has been very satisfied with Power's driving, especially his second place on the streets of Long Beach. Power is hardly a specialist on ovals though he is is learning fast as he fights for his racing future. At Indy last year, where he was a rookie for KV Racing, Power started 23rd and finished 13th. This year during the prelims he has been coached by multiple 500 winner Rick Mears. Penske hasn't won at Indy for two years. But with Castroneves, Briscoe and Power driving in 2009 has three strong chances to post the team's 15th triumph. 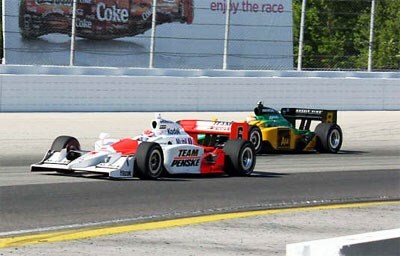 But Penske himself senses it will be tough, with 10-12 drivers capable of winning the classic on May 24.